It's Mother's Day. My cats have been extra lovey, probably because they were out of food in their dishes. It's a brilliantly beautiful, if cool morning. There's a stiff breeze. I wandered into the kitchen for breakfast and those horrid little black ants about an eighth of an inch long were all over the counter. I had left an empty jar of chocolate syrup to soak before recycling and they had attacked the jar rims with a vengeance. I can't find where they care coming in, however. That's what really, really frustrates me. The jar has been removed to the deck and the counters sprayed down with Lysol Kitchen Cleaner (another one of my 'loves'). I have the last of the dishes to wash sitting on the stove. I'm going to give the spray a time to work, then wash it off, rinse and pour a small amount of bleach straight onto the counters, moving it around with the wash cloth. I'm hopeful that will remove any 'trail' pheromones the ants might have laid down as well as remove any last molecules of food. Then, I can wash the last of the dishes and maybe put this problem to bed. I have sorted laundry and a load is washing. I've read a computer magazine and sorted a pile of newspaper clippings. Why did I save some of this? Who knows. It was relevant at the time I saw it, but it certainly isn't now. Recycle and then take the paper recycling out to the main can. I put the serving sized pieces of the Grape Applesauce Cake Carole and I made on Wednesday into bags and tucked those in the freezer. Now I have dessert easily packaged for work or home. Honestly, I haven't been this productive in weeks. I think it's the good night's sleep I've had over the past week, even on an air mattress. I know you're wanting to know what my daughter gave me for Mother's Day. There are two cards, one from her and one from the cats. You may think it's cheeky but I rather like the fact that card companies have cards purporting to be from the pet. Yeah, yeah, yet another way to part you from $2.69, but the cards are generally funny and who doesn't need to laugh more. In addition to her simply being here an extra day, which I consider a gift in and of itself, she paid for admission to the museum and to the zoo as well as my lunch at both venues and brunch on Wednesday. I wish I could have been the one paying but she understands and reminds me that this phase will pass and I can reciprocate at a later date. She and David gave me a wonderful gift by removing the trash trees from the front flower beds. This is the north side of the front. This is the south side of the front. Yes, both beds are still rather weedy. 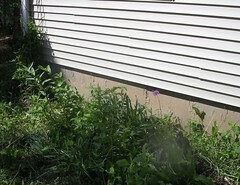 I need to get out there and really weed and remove the plants I don't want. They also sprayed Round-Up on the tree stumps they could see. Supposedly, this will kill those volunteer trees. I've come to realize that I am blessed that I have Zeke to mow my lawn when I want. 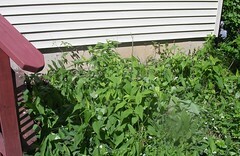 Given my allergies, there is just no way I would be able to mow and not be horribly sick, even taking medication. Now, it needs to warm up so I can be outside in small chunks of time and maybe, perhaps, things will look better. This was a great gift for me. I now just need to swing by the hardware store and purchase yard waste stickers for the weeds to haul them out to the street. 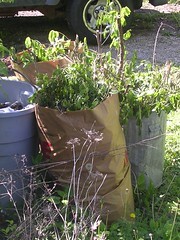 David managed to make all the stuff we removed fit into my last two yard waste bags and the can. There was an actual gift this year. Carole went to Boston over St. Patrick's Day. While she was there, she did most of the touristy things and wound up at a shop selling foodstuffs. I've always said tea is a perfect gift for me. 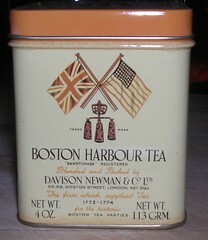 This tea is similar to the tea tossed overboard by colonists at the Boston Tea Party. It's dark with a bite, just the way I like tea. This is loose leaf tea. I can get 3-4 cups from the amount of leaves I use. So, this is a good Mother's Day. While the day feels like every other day, that is, of itself, a blessing. I kind of feel like baking. I tried a new muffin recipe but either the oven temperature was too hot or the time listed in the recipe was too long because they burned. That's sad because muffins, as you know, are another one of my 'loves'. But I have hundreds of muffin recipes in this house. Let's see what I can find. saving all those clippings; another family trait. your grandmother did it, i do it,and now u . best warn carole!! !